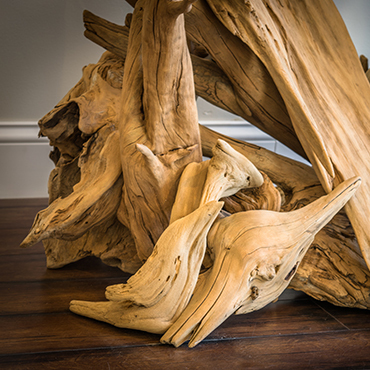 A unique marriage of function and form – created one at a time by driftwood artisan Chris Cobb. 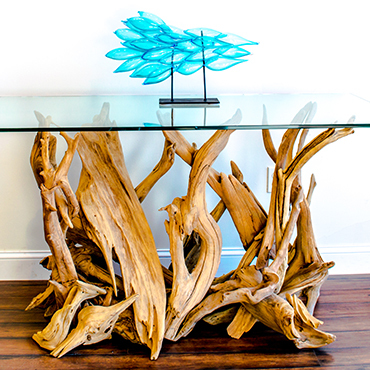 All individual pieces involved in the creation of the driftwood coffee tables are used in their raw state. No modifications made – only the perfect piece selected. Architect meets engineer throughout the creative process, as aesthetic appeal and structural stability are the highest priority. The process is a pick and place technique with no cuts made; a painstaking endeavor with a most gratifying result. Some driftwood coffee tables are built with diversity in mind and will carry a square or round top. Here at Chris Cobb Studio, our inventory changes often. We suggest you contact us to ensure current product availability. We welcome custom sizes and shape requests. The result is useful art, sized and shaped to your specific space. All of our tables are built one piece at a time with no cuts made. 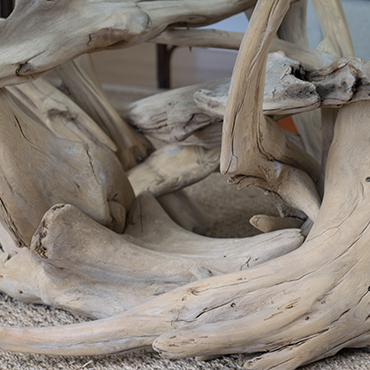 Each individual driftwood piece is thoroughly cleaned through a media blasting process. Then predrilled and secured with exterior grade trim head finish screws for a solid and stable connection. All driftwood coffee tables meet strict level guidelines before they leave the shop.